Earlier today I spent some time considering all the different variables that are preventing me from jumping for joy over the new TMNT movie project. The list got quite long and long-winded, so I'm going to try to tackle the bigger ideas in a series of posts. To start, I've pulled out a series of interviews published before the release of TMNT 2007 from my personal archives. The point of bringing these out is to illustrate how similar the attitude and direction was for TMNT 2007 compared to what (granted, very) little has been said so far of the new project. And in some cases, how the exact opposite of the ideas sold to us for the 2007 movie are now being moved forward. You can download a PDF of these interviews here. Before I go any further, I'd just like to make it clear that I really, truly love TMNT. Kevin Munroe gets the characters and I would have no problem were they ever entrusted to him again. I think he did a fantastic job working within all the limitations he was given. TMNT wasn't a bad movie, but it seemed to scratch the surface on what could have been a reallyreally great and more-successful movie. One of the big talking points for TMNT 2007 was that it was going back to the comic books for inpiration. Now, almost as if that's been completely forgotten, the new movie is going back to the comic books once again. And in TMNT 2007, where both the Turtles' origin and Shredder were left out of the picture because, "Been there, done that," now the new movie will be not just be revisiting both those points, but will seemingly be built upon them as a foundation. The TMNT, particularly in the last 10 years, have struggled emensely to escape the first 11 issues of the comic book. It seems that each adaptation isn't good enough so then we have to do it all again... it's become tiresome and boring. The comic books should be used as inspiration, but straight adaptation should be kept to a bare minimum. Change things up while maintaining all the elements that have kept fans around through thick and thin (A LOT of thin) for 25 years. There were two key reasons for the 2007 movie to be done in CGI. The first, and apparently biggest factor, was cost. A live action film was predicted to cost at least three times as much as a CGI film. The second reason was to avoid the limitations presented by having guys in rubber suits do ninja moves. Makes sense, but now we have this new movie apparently ready to once again put live action guys in rubber suits. So long as all parties involved are willing to spend the money needed to make the rubber suits and CGI combine seamlessly to look believable and not cheesy, this could work out fantastically. But they have to be willing to spend the money. Up 'til now, the most expensive TMNT movie was 2007's at around $35 million. Before that was 1993's TMNT 3, at around $26 million (and we all know how that turned out). Batman Begins has become the ultimate point of comparison when it comes to reinventing an old franchise into something new, exciting, and extremely successful. Rightfully so? Perhaps, although I think it's become overused to the point of cliché. To what extent does the comparison exist with the TMNT? Well, not only was this instantly discussed when news of the new movie broke last week, but - wait for it - it was discussed with the 2007 movie as well. Click the pic below to compare words from Animation Magazine in April 2007 to an MTV interview with Peter Laird released just today. What is the point of all this? Well, just because all the creative minds have their hearts and intentions in the right place doesn't mean the project is going to come out and be embraced as they anticipated it would be. By the sounds of it, TMNT 2007 started out in the very much the same place that TMNT 2011 seems to be now. As hoped, Neil has uploaded more video from the TMNT Galabunga last week - Check 'em out! Astute TMNT fans know that tonight was the TMNT25 Galabunga event that included a free screening of the first TMNT movie. The always reliable Neil gives us this video montage of the event. Hopefully there will be more in upcoming days! New Live Action Ninja Turtles Movie Announced! Variety is reporting tonight the announcement of a new live action TMNT film to be produced with a target release date of sometime in 2011. Details on the project are few at this point, but the film will apparently focus on the characters' origins. Thanks to Will Tupper for the heads-up! In recent years Mirage has teased us, saying that they would publish this "lost" story... but still, it never came. Until now!! Using the 25th anniversary as a pretty good excuse, wheels are really turning and "The Forever War" will finally see print! There's been a lack of details as to when and how we'd see it, but the answers seem to have finally arrived. Cap e-mailed in with the above picture, which is a full-page advertisement for "The Forever War," stating it will (still) be in five parts and the first will be shipping in August (I think the previous best guess had been September). To make sure that your comic shop orders the book (and saves you a copy!) just print out the ad and bring it in to them - The information at the bottom will help ensure that they get it for you! This scan is from the back of the Free Comic Book Day reprint of TMNT Vol. 1 #1 - Don't forget to visit your local comic shop on May 2nd to pick up your copy of that book!! Shameless plug alert! Yes, all of the following are my own auctions. Click each picture to be taken to the corresponding auction. Saint Turtle! 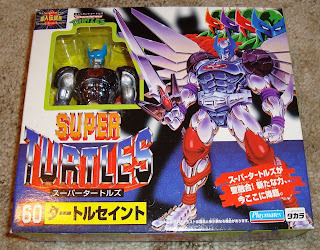 This is possibly one of the coolest TMNT action figures ever, and it was only available in Japan - No US variation exists! Saint Turtle is the result of the TMNT being adapted for Japanese anime and manga audiences. All four Turtles use transformation crystals to become "Super Turtles," then when the situation becomes most dire they combine their forces (literally!) to deliver a finishing blow. 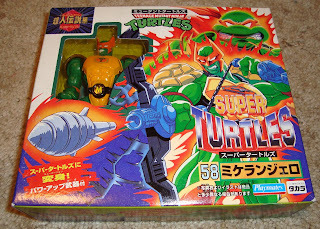 Super Turtles Michaelangelo! This is the pre-Saint Turtle transformation of Michaelangelo. 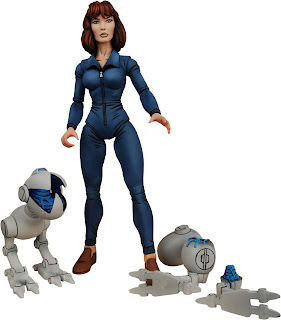 A variation of this figure was released in the US, but it differed in size and detail. 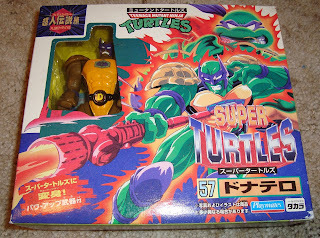 Super Turtles Donatello! Like the Michaelangelo figure above, this is the pre-Saint Turtle transformation of Donatello. A variation of this figure was released in the US, but it differed in size and detail. 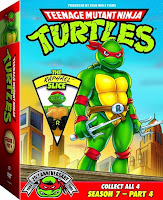 Promotional material for the May 12th release of Season 7 of the original TMNT cartoon on DVD has been made available including box art, trailer (commercial), and fact sheet. COWABUNGA! 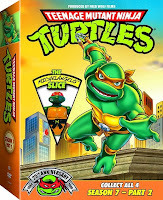 It’s been 25 years since Leonardo, Michelangelo, Raphael, and Donatello, emerged from the sewers of Manhattan and were transformed into heroes-in-a-half-shell battling petty criminals, evil megalomaniacs, and alien invaders. 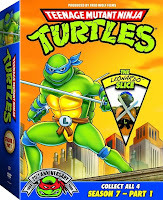 To celebrate the 25th anniversary of the Teenage Mutant Ninja Turtles®, Lionsgate Home Entertainment is presenting all 27 episodes of Teenage Mutant Ninja Turtles: Season 7, available for the first-time ever on DVD. Fans can collect the commemorative set that will be sold as four separate DVDs, each featuring different episodes from Season 7 and a Mini-Classic Turtles Action Figure! 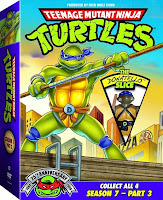 All four DVDs feature a different turtle on the cover, and fit together to create one power-packed scene with all of the wise-cracking, pizza-obsessed superheroes aligned and ready for battling evil. The Teenage Mutant Ninja Turtles: Season 7 DVDs will be available on May 12th, for the suggested retail price of $14.98 each. Click each slice below to pre-order at Amazon.com for the low price of $9.99/each. And finally, you can download the full fact sheet here. 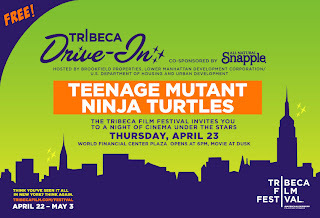 Here's the low-down on how to see the free screening of the first TMNT movie for free at the Tribeca Film Festival, courtesy of TMNT25.com.